while your straight molding is still a little bit long put it where you want it. and trace both sides of it with a fine pencil, scoring knife or what have you. you can do this with 2 straight pieces as well. try it out with 2 rulers on a piece of paper you will see what I mean. Your problem is that the radius of the curved piece is wrong. If your intent is to have a smooth transition at both ends, the radius must be such that the curve piece and the straight pieces must meet at the tangent points of the curve (circle segment). 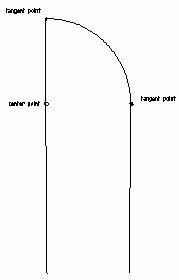 In doing this, your radius point will fall on the left side straight piece and be down from the top equal to the distance between the left and right straight pieces. You will then have a 45 degree cut at the top of the left piece and an 90 degree cut in the right one.